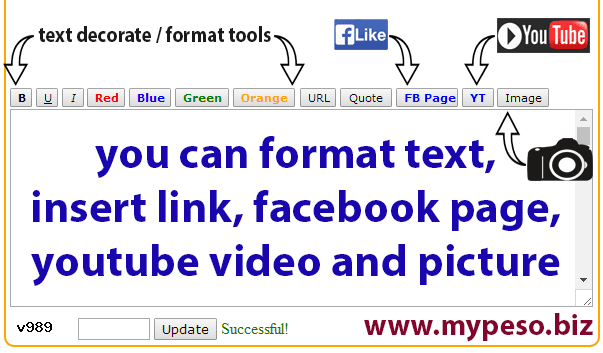 Spice up your page and profile with formatted text, videos, links and photos. How to update your page and profile? It's incredibly easy, just click your www.mypeso.biz/profile.php or www.mypeso.biz/updatemybizpage , then fill up the form. You can edit / update your content anytime. Formatting or styling your post is very easy, just select or highlight the text / url you have already typed then click the action button at the top. You may download your content for offline editing just click Download source code. Select/highlight the URL/direct link of the picture/photo then click the Image button at the top. Just select or highlight the URL/link you have typed, then click URL button. How to add FACEBOOK Like button? Select or highlight the FB page name i.e. 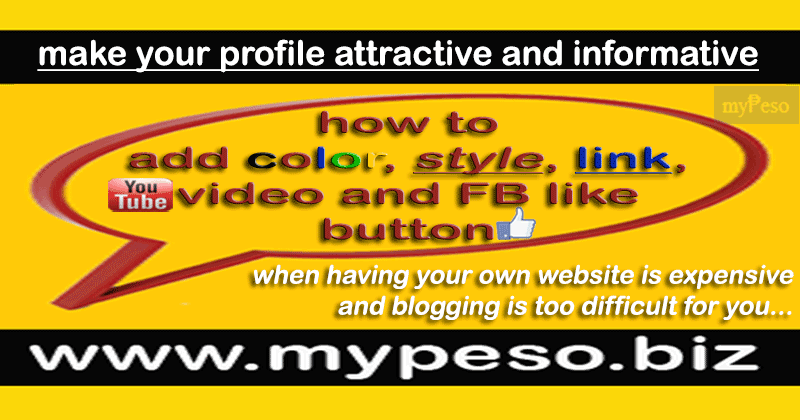 mypeso.biz based on given FB page, then click the FB Page button. Just copy the unique string assign to the YOUTUBE video. Finding the string is very easy, see screenshot below. Copy the information in the red box and paste it here, then click the YT button. Or simply copy and paste the URL then click YT button.